Don’t clean greens until ready to cook. Many people are unaware that beet leaves are edible and have many nutritional benefits. While beets themselves are rich in calcium, vitamin A, iron, and other healthy minerals, their leaves are excellent sources of vitamin A, vitamin C, protein, and dietary fiber. Beet leaves are somewhat chewy and woody when raw, similar to kale, collard greens, or Swiss chard. Because of the rough texture, the leaves are easier to chew, swallow, and digest when they're cooked or blended. 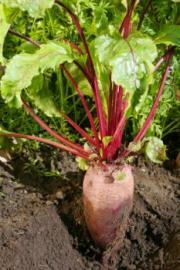 When you purchase beets, look for strong, vibrant color in both the roots and the leaves. Greens should look fresh, dark, and feel tender but not wilted or slimy. When you get them home, cut greens off near the top of the stems and store them, unwashed, in a plastic zip-top bag for up to four days. Rinsed and dried beet leaves will wilt and decay faster than unwashed leaves, so don't clean greens until you're ready to cook with them. To prepare the leaves for cooking, rinse and dry them thoroughly by patting with paper towels. Handle the leaves as you would any other cooking greens. Remove the stems, chop them into bite-sized pieces, and cook them as directed in your recipe. 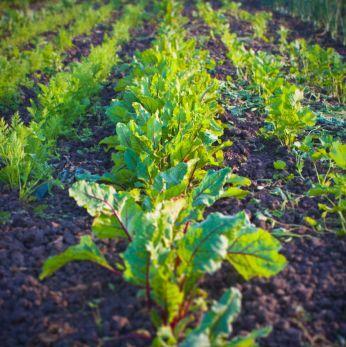 To soften beet leaves and make them more pleasant to chew, cook them instead of eating them raw. You can choose to sauté, steam, blanch, or pulse the fresh leaves. After rinsing and drying the beet leaves, transfer them to a sauté pan that is greased with a layer of oil or butter. You may want to sauté onions, peppers, potatoes, or other vegetables before adding the greens. Cook over medium heat, stirring often, until the beet leaves are wilted and tender, about five minutes. To prevent the leaves from sticking to the pan and to keep them tender, you can also choose to add a small amount of water when sautéing. Steam beet leaves as you would kale or chard. Use a commercial steamer or, if you don't have one, a colander placed on top of a small pot. Fill the pot about halfway full with water or until the water level is just below the bottom of the colander. Set the water on high until it boils. When it does, place the colander over the pot and add the beet leaves to the colander. Loosely cover the colander with a heatproof lid, and let the beet greens steam until they are tender, about seven minutes. To blanch greens, prepare a large pot of water with a sprinkle of salt. Heat the water on high until it begins to boil, and add the clean beet leaves. Blanche them in the boiling water for about one minute. Remove the greens from the water with a slotted spoon, and dry them as thoroughly as possible. You can sauté the greens after blanching or eat them after you dry them. You can also choose to boil the greens for longer than just a few minutes and use them in a soup or stew. Raw beet leaves can be pulsed in a blender or food processor and added to a green smoothie or used to make pesto with the addition of cheese, salt, garlic, and nuts. When mincing or pulsing raw beet greens, keep in mind that their natural texture is woody and tough, so the finished mixture may still be chunky and somewhat tough to eat. If you'd prefer to cut down on the woodiness of the leaves, try blanching or sautéing them first, then pulsing in a food processor. Add the finished mixture to your recipe.